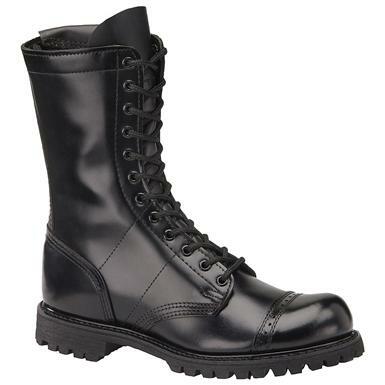 Corcoran® 10" Side Zip Field Boots. Heavy-duty toughness for heavy-duty work. You'd pass inspection by the pickiest sergeant with these spit-shineable Boots! With their look of authority, the guys in your crew might think you're their new boss! One piece 120+ oil resistant lug outsole. Each approx. 10" h., 27 ozs. Mens Corcoran 10 Side Zip Field Boots, Black is rated 4.5 out of 5 by 2. Rated 5 out of 5 by Uncle Kes from An American Classic! I have been buying Corcoran boots for many many years now.. I have never had a bad experience with them. Oh sure, there are boots out there,that are cheaper; some even have good quality and durability you would expect in a top of the llne boot. But to find a boot that is American made, with this kind of quality, durability and history (Corcorans have been made since World War Two); when you find s boot like this, you don't ask questions-you just buy them, take them home, wear them and enjoy them for many years! Rated 4 out of 5 by sandspur from check the snaps beautiful boot, but quality control didn't check the snaps that go over the zipper. broken on one boot. others were fine. hate I had to repair as soon as I received them but not worth sending back and waiting weeks for a replacement.